Fairfax County recently applied for funding of a bikesharing feasibility study through the Metropolitan Washington Council of Governments Transportation/Land Use Connections (TLC) Technical Assistance Program. "The TLC Technical Assistance Program provides focused consultant assistance to local jurisdictions working on creative, forward-thinking and sustainable plans and projects." While several areas in the county could support bike sharing, the study will focus on the Reston area. Reston has a network of recreational trails, concentrated mixed-use development at the Reston Town Center, Village Centers located within easy biking distance of most residents, and the soon-to-be-completed Wiehle Ave Metro station. Much more needs to be done to make Reston truly bike-friendly but we think bike sharing could work there. 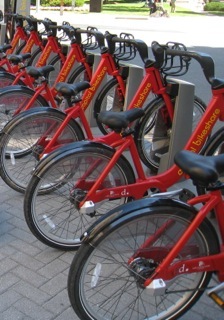 Last year we wrote an article about the feasibility of bikesharing in Reston. The article was cross posted on Reston Patch. In March of 2013, the Metropolitan Washington Council of Governments (MWCOG) released its request for FY2014 Transportation/Land Use Connections (TLC) Technical Assistance Program applications. This program is designed to provide technical assistance to local jurisdictions working on creative, forward-thinking and sustainable transportation and land use plans and projects. In response to MWCOG’s request, please find attached for your consideration an application for conducting a feasibility study titled, “A Study to Explorethe Feasibility of Implementing Capital Bikeshare in Reston, Virginia”. With the popularity of Capital Bikeshare (CaBi) growing in Arlington, the District, and now Alexandria, we are receiving more and more requests to bring CaBi to Fairfax County. While we acknowledge that many areas of the County can’t support bike sharing, we strongly believe that it can work in in our emerging urbanized centers and transit station areas such as Tysons Corner, Merrifield-Dunn Loring, and Reston. However, further study is required to determine the feasibility of Capital Bikeshare: can it work in an urbanized center such as those mentioned, what are the associated costs (both capital and operating), Where should the stations be located, and how many stations and bikes are needed to make this system successful? Technical assistance through the “Transportation/Land Use Connections Program” can provide the necessary guidance and support to define the feasibility of Capital Bikeshare and address these issues. After consultation with our Department of Transportation bicycle program staff as well as bicycle advocates, the Reston area of the County was chosen. Our reasoning is based on the following: the Reston area has the highest concentration of active bicyclists in the County, there is an emerging bike culture forming, Reston embraced our first two road-diet projects which included bike lanes, and there is strong corporate and residential support to initiate bike sharing in Reston. Furthermore, the findings developed from conducting this study can assist other areas of the region in making sound decisions regarding bike sharing. I believe this application is in the spirit of the TLC program and will aid in the County’s planning efforts to accomplish the goal of balancing multi-modal transportation and landuse.